I Dropped My iPhone in the Toilet. How to Dry Out My iPhone & Save My Data? I dropped my iPhone in the toilet while listening to my favourite hip-hop music. What should I do to dry out it? How can I save my data? Please help! You are not alone. Being an integral part of life, mobile devices, for example iPhone, aren't restricted to your desk or bed anymore. We carry it with us everywhere we go. Many people like to bring their iPhone when they go to the washroom or toilet. Unfortunately, iPhone get dropped in the toilet sometimes. This is not a rare case actually. Plenty of people have been through this and they have looked for the right way to fix their iPhones. It is essential that you retrieve your iPhone immediately and then the damage might be reduced. We know it's worrisome to find your iPhone like that. Therefore, we are going to introduce you to some wonderful fixes for your iPhone. Keep reading! 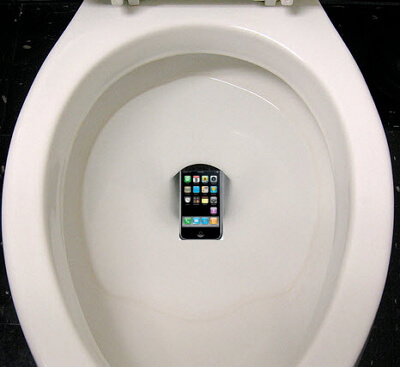 If you have dropped your iPhone in the toilet, then the most important thing right after retrieving it is to turn it off. Do not turn on the device, if it's already switched off. Turning on the iPhone would short-circuit the device and cause more damage. Now, you need to follow the below mentioned procedures. Get your iPhone off the water and then get a piece of fabric or tissues to get rid of the moisture. Pick a plastic bag with a zipper closure and fill it with raw rice or silica-gel packets and put your iPhone inside it and close the zipper. 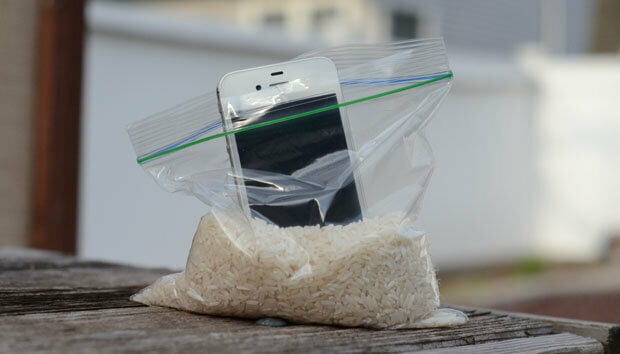 Ensure that the iPhone is completely covered with rice and there is no air within the bag. Alternatively, a bowl of rice or a well ventilated dry room with a fan blowing cool air will suffice. Allow 24 to 48 hours for your iPhone to be completely dried within the pouch. Before trying to turn on your iPhone, make sure that the LCI is not activated in your iPhone. 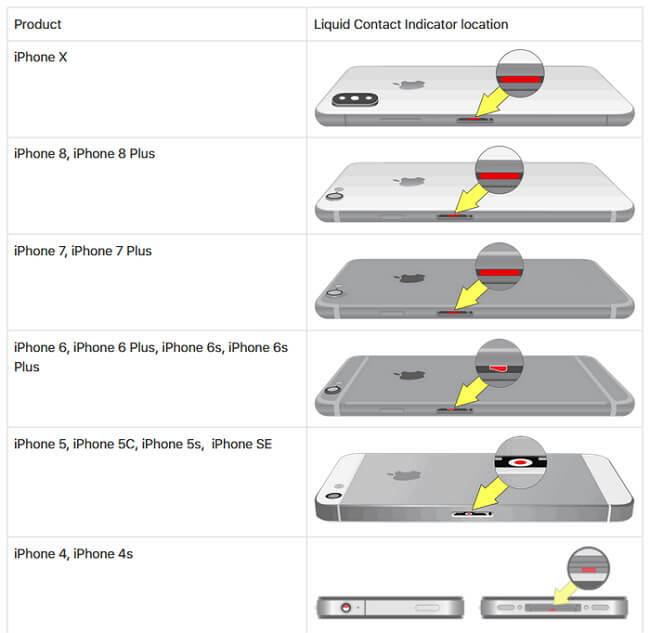 Liquid Contact Indicator (LCI) is an iPhone feature that gets activated when the phone gets damaged by water. If it glows bright red means water has spoiled the device. It is located at the side of your iPhone. In case the phone doesn't turn on after drying or the LCI is activated, then rush to the nearest Apple store. The support team would be able to help you in this regard. Part 2. How to Save My Data When iPhone Is Water Damaged? If your are fortunate and your iPhone turns on, it is essential to take a backup as soon as possible. Connect it to iTunes and do that fast. Unfortunately, if the iPhone turned off after it's dropped in the toilet, then you have limited choices. You can either log in on iCloud.com to access the data you synced to iCloud, or recover data from iCloud and iTunes backup. You can opt iMyFone D-Back for recovering data from iTunes or iCloud backup. 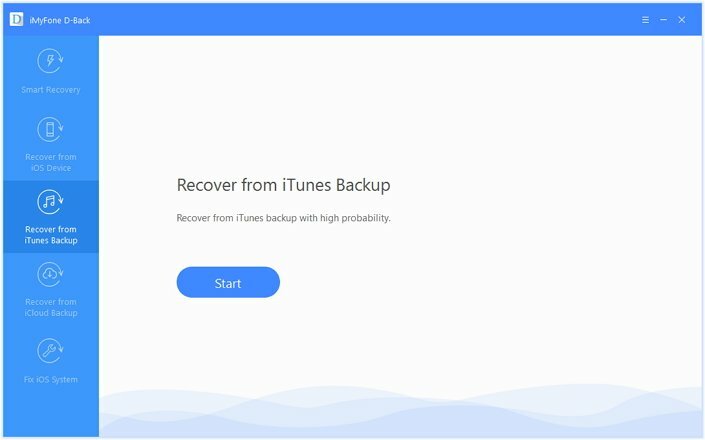 It has 4 recovery modes namely Smart Recovery, recover from iCloud backup, recover from iOS device, and recover from iTunes backup. 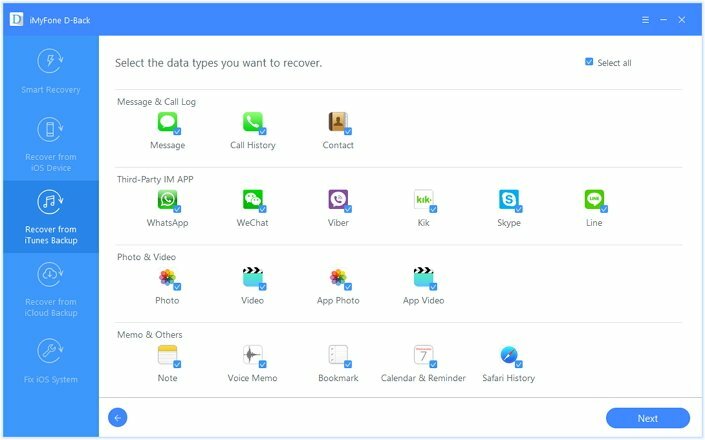 This software can recover lost data from your iPhone/iPad/iPod touch or iCloud/iTunes backup with ease, which helps you get back as more data as possible. That means, you can also recover the deleted data from iTunes or iCloud backup files because iTunes and iCloud also backs up the deleted data on your iPhone. It supports more than 20 data types. WhatsApp, Kik, WeChat, messages, photos, contacts, notes, etc. are few of them. We will show how to recover iPhone data after you dropped the iPhone in the toilet. Here is the step-by-step guide for recovering data from iTunes backup using iMyFone D-Back. Step 1: Install iMyFone D-Back on your computer and launch it afterwards. After the software gets launched, tap on 'Recover from iTunes backup' option from the left side panel. You need to click the 'Start' button subsequently to proceed. Choose the data type that you want to recover or choose all the types. 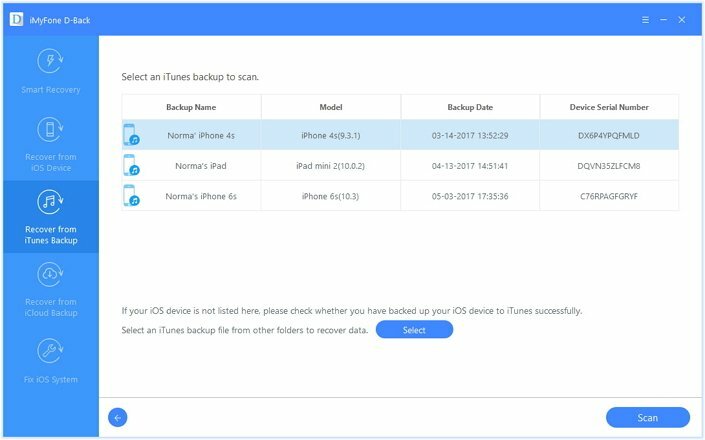 Note: Make sure that your iPhone have been previously backed up using iTunes on this computer. Step 2: Now, the software will show you all the iTunes backup on that computer. In this step, you need to select the desired iTunes backup of the iPhone that you've dropped in the toilet , from the list of backup files displayed. Click the 'Scan' button right after that. The software will require a little time to scan the backup. 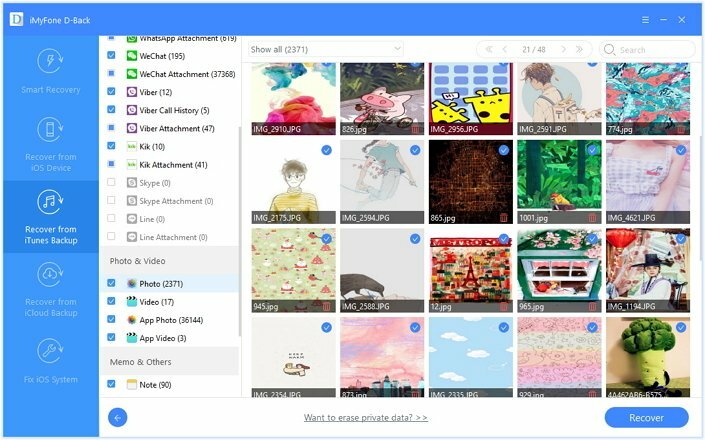 Step 4: Now, the scanned data will be displayed on your computer screen and you can preview it by tapping a particular file type from the left panel. Once you are done selecting the data, tap on the 'Recover' button and wait. You need to select a destination folder, so that the data will get recovered to that specific folder. You can go through it once the data has been recovered. As you can see in the above screenshot, the deleted photos (coming with a red bin) are also recovered. If you restore the backup to your iPhone, you will not be able to see the deleted data. However, iMyFone D-Back can find the deleted data in iTunes/iCloud backup and help you recover them without restoring. You can just download the program to have a try.